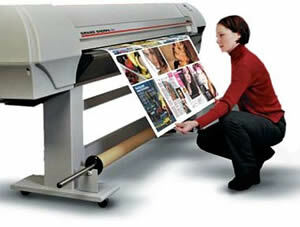 Super-large format printing. Our Agfa large-format inkjet printers can print up to 1,524mm wide by any length. For convenience we also offer standard 'A' size posters (A2, A1 and A0). Dye-based or solvent-based inks. For internal use, we can use use less expensive dye-based inks for your prints. Where your print will be exposed to sunlight we recommend the use of solvent-based inks which are resistant to the bleaching effect of UV light. For ease of displaying A2, A1 and A0 prints outdoors see our range of weatherproof 'A' boards. For internal display you may be interested in our poster snaps. Tip: If you are looking for larger quantities of large format prints, please see our Litho Printed Posters page. Banner vinyl with optional brass eyelets and ropes. We are happy to advise on the most suitable and cost-effective material for your application — please call our Design Advice Line on 01457 778788. The prices shown here are based on multiple prints of a single file. Large format prints are standard rated for VAT. Because of the individual nature of large format prints we are unable to provide samples. We are happy to provide free, no-obligation advice on which inks and material types would best meet your needs.